Distribution: Bangladesh, Bhutan, Burma, India and Nepal. Distribution: Burma, Cambodia, China, Laos, Thailand and Vietnam. Distribution: Presumably extinct from the Wild. Ya got a furry inneresting bloggie. Keep up the good work! Hi! I saw your comment on Mr. Hendrix blog and thought I'd stop by. Very intersting facts on big kitties! thanx lady d. hope conservation is starting in your country to protect tigers. it's such a wonderful thing to be able to go see tigers in the wild in your own country. thanx for the adds catzee and tara. keep visiting. I would be very happy to exchange links. Your approach to Cats is intelligent and informative. It's about time someone took us seriously. After all, Cats are the superior species. These numbers are greatly exaggerated. For the last 30 years (at least) no one met wild siberian tiger weighing more then 500 lbs. Let alone 500 lbs tigress. All 800+ lbs tiger are overfed zoo specimens. In fact, recent research by Wildlife Conservation Society showed, that average weight of wild siberian male is 180 kg, female - 122 kg. 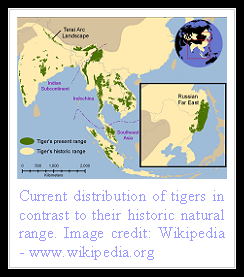 It would mean that bengal tiger is the largest one, contrary to popular belief. Hardcorp, WCS also admited to having a limited number of specimens with a weak gene pool. Another study was conducted by a team in the Sikhote Alin mountain range by Alan Rabinowitz, and thus gave an average of 660lbs for healthy males, and maybe greater depending on prey.